As a director of store design at Ralph Lauren, Dan Mazzarini learned a few things from his superstar boss. One lesson in particular has served the young New York designer well since founding his own interiors firm, BHDM, four years ago. “Black is always dramatic, no matter what,” he explains. Mazzarini notes that Tuxedo black is Lauren’s go-to for elegant, tailored looks. Or there’s also the drop-dead glamour of Piano black, its lacquered gloss asserting an undeniable luxury statement amongst neutrals. The bay window of this 1910 Brooklyn apartment was its most striking original feature. To enhance it, as Ralph Lauren might, Mazzarini chose Fine Paints of Europe’s Hollandlac paint in glossy black. Completing the black-and-white look, Serge Mouille’s lighting is also black, as are the metal cocktail table and the brushed-oak Gerrit Rietveld Zig-Zag chair. Having removed the mantel and painted the chimney breast white, Mazzarini used heat-proof black paint to clean up the firebox. The finishing touch is a striking oversize Bridget Riley herringbone print from the Mad Men era. Having moved to a New York suburb, these clients asked Mazzarini to style their dining room like a set from a Nancy Meyers’s movie. He re-stained oak floors to block their yellow cast and added texture with grooved white paneling and updated trim. With the background cleaned up, “black adds a base note to the room,” Mazzarini says. 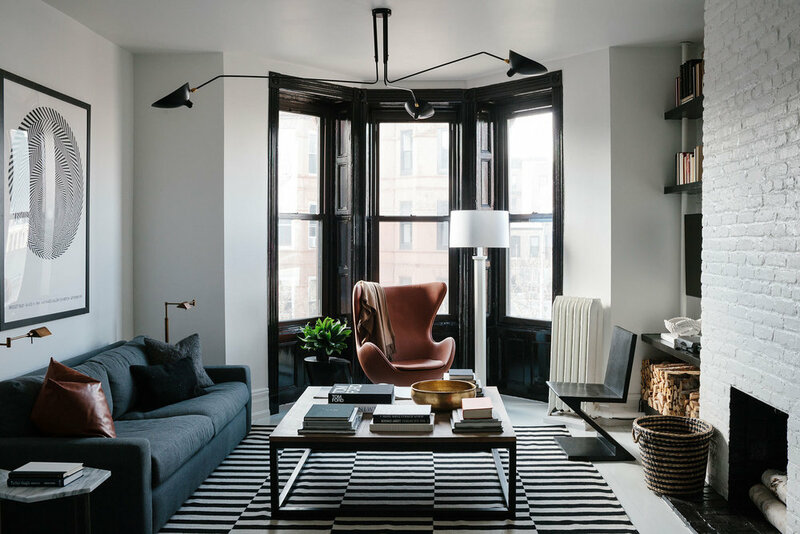 Black appears in two metal textures—rough hand-wrought iron for curtain hardware and the overscale lantern, and the sleek blackened-steel of the Klismos chairs. Brown-leather wingbacks deliver an informality that keeps the black accents from seeming uptight. This black window frame, in the dining area of the same Brooklyn apartment, exemplifies the Calvin Klein approach. Black helps the frame disappear—since it was never anything particularly special to look at. Painting the surrounding trim white reinforces the black’s role, conceptually speaking, as a cloak of invisibility. The chairs, however, skew back to Ralph Lauren’s attitude toward black accents. “This room doesn’t have much architecture, and they bring in a classical element as a focal point,” Mazzarini says.